Heviz is the largest and best known medicinal bath in Hungary, located just 6 km from the northern shore of Lake Balaton, with important tourism. The thermal lake with a surface of 47,500 m², covered with water lilies is the largest lake with peat bottom in the world. The temperature of the rushing water is 36 ºC. During the summer the water of the lake is a constant 33-34 ºC, while in winter it never falls below 26 ºC. The medicinal water has a special curative effect on the different kinds of rheumatic, locomotor, muscle and nervous system’s disorders and gynaecological problems. CE Quelle Hotel is located in the center of Heviz, only 300 meters from the thermal lake of Heviz. The spa and wellness hotel in familiar atmosphere awaits the guests with 51 friendly rooms and apartments, restaurant, drink bar, wellness and beauty department, conference and session rooms. The 4-star Ce Quelle Hotel is an ideal place for young lovers seeking romance, for those who seek rejuvenation and for business travelers as well. Wellness Ce Quelle Hotel in Heviz is the best choice for those who prefer active relaxation. The newly-built Bonvital Wellness Hotel Hévíz **** superior in Heviz awaits its guests longing for relaxation and recovery from January 2013 within a few minutes walk from the thermal lake. The hotel is connected to the St. Andras Hospital via a heated passage, so the medical treatments of Hotel Bonvital **** can be combined with the hospital's treatments. Hotel Bonvital in Heviz is with exclusive double rooms, a wide range of wellness and medical services at the guests' disposal. In the centre of Heviz, Hunguest Hotel Helios is a fully-renovated wellness and spa hotel at discount prices. It awaits its guests about 500 metres away from the world famous thermal lake of Heviz, in a 45 000 m² wellness park with two buildings. The splendid 4-star spa and wellness hotel, Danubius Thermal Hotel Aqua is situated near the world famous thermal lake of Heviz, in a tranquil environment, looking over a superb view. The thermal hotel has its own health centre offering treatments for locomotor and rheumatic diseases. 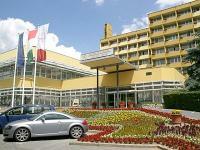 Thermal hotels, spa hotels, Heviz, Hungary, online booking. Only 500 m from the well-known thermal lake of Heviz is situated this 4-star superior spa- and wellness hotel where a highly educated team takes care of your feeling well. You can forget the every day stress and enjoy your holiday. 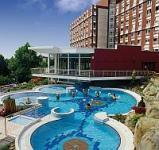 5-star hotel in Heviz with discounted prices Lotus Therme Hotel and Spa. The 4-star spa thermal hotel NaturMed Hotel Carbona**** is situated in Mediterranean environment in Heviz, offers open air fun bath with a water surface of 1000 m2, a thermal bath evoking the atmosphere of Roman times and numerous opportunities for therapeutic methods and wellness all year round! With its distinguished look Hotel Palace**** Hévíz emerges from the picturesque surroundings of the Hévíz Thermal Lake which is renowned for its magnificent, curative water. Located in the pedestrian street of Hévíz, just 200 meters from the thermal lake, the hotel waits its guests in an elegant atmosphere with 165 spacious, non-smoking rooms and apartments. Experienced, flexible and friendly staff with personalized service is ready to meet all your needs. The riding pension - with a qualification of 3 horseshoes - recommends riding tours for skilled riders and training courses for beginners. 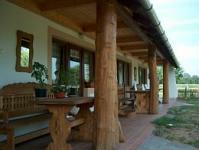 Attractive and quiet surroundings, Hungarian cuisine, well-trained horses and German speaking staff await the guests. 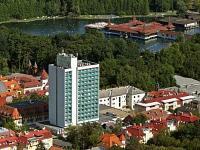 The world famous Hévíz Thermal Lake and Health Spa is only a few minutes walk from the pension.